It’s slightly overcast and cloudy as we pull onto the dock and look for this ship. There is no one to tell you what to do but we see a couple of cars lined up in front of this big red, white and black ship that looks like a cruise ship. 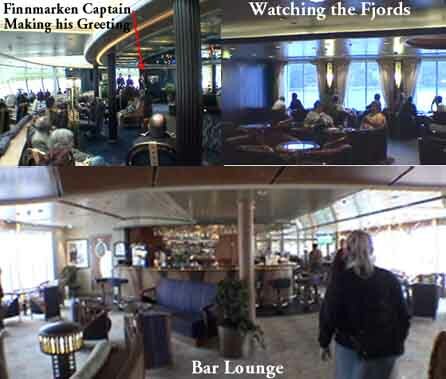 It’s labeled the M/S Finnmarken. I walked over to one of the longshoremen loading it and asked if this is where we get in line and he affirms my guess. We wait awhile and finally are instructed to pull the car into this hole in the side of the ship. It takes us onto an elevator that lowers the car to the floor level and a man takes the car to park it among the rest. We tell him we’re getting off in Trondheim which gives us a special sticker. How they keep them all sorted out for exit I don’t know. We haul our bags through this heavy door and finally find a service elevator which takes us up to the registration desk. Like a hotel we check in and get a room on the 5th floor. 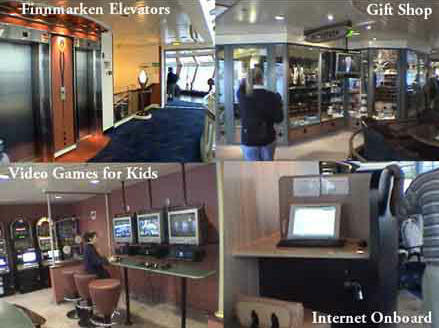 This ship has 8 levels and we discover is the newest ship on the Hurtigruten line – we really lucked out big time. After I pay the 5880 Kr ($820) for the two of us and the car, we are directed to the luxury elevators that take us up to our room. 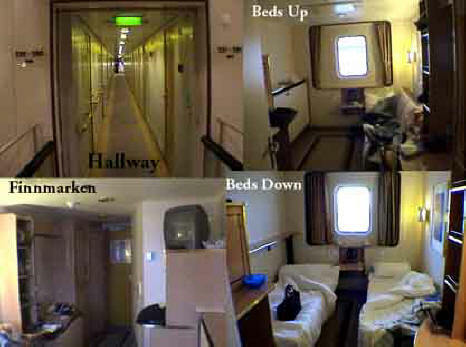 The room was really very nice (above right) with a sea view (which cost a little more). On our way down the elevator we join a group of men dressed in black like priests. 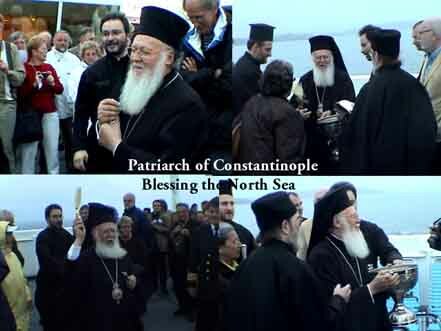 The older white-bearded man was obviously Orthodox and a higher up. He was a very pleasant and sweet man and I spoke in English with him. Then I realized that he might be going to this religious conference in Trondheim that caused all the rooms to be booked. I later found out I was right. 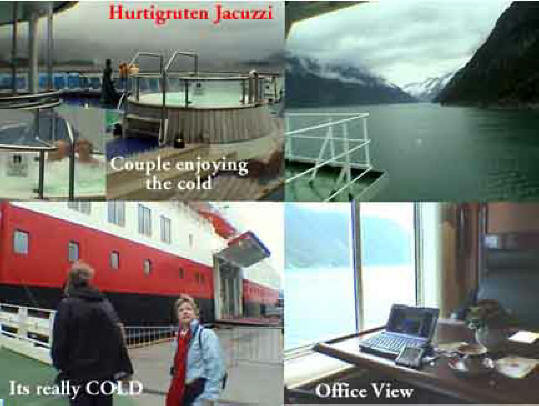 The idea for these Hurtigruten ships was one of Capt. Richard With and, though everyone doubted an express route could be navigated through the treacherous waters of the northern Norwegian coast especially in the dark winter months, a contract was signed with the government in May of 1893 (110 years ago). 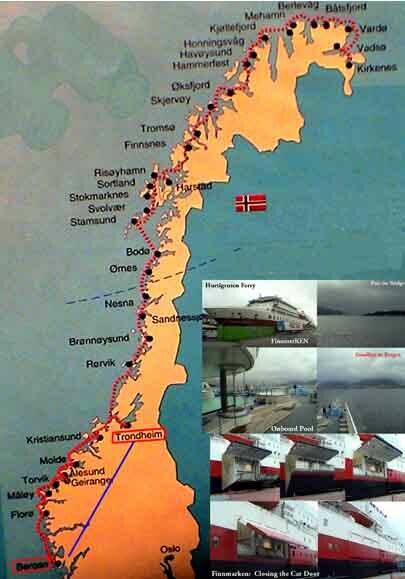 It started with just summer trips from Trondheim to Hammerfest, with winter stops in Tromsø. Now there are 11 ships run by two different shipping companies which travel from Bergen in the south to Kirkenes in the north stopping at 34 different ports. A northbound and a southbound ship leave each day. It has become the lifeline for many of the communities it stops in. Marcia went to bed and I had another beer at the bar to check out the scene which was now thinning out and went to bed at 2 AM. Many people took the opportunity to try out the warm Jacuzzi in the cold air. Marcia and I didn't have the guts. I finally got on the treadmill and just as I was half finished running, they announced that we were arriving at Ålesund in a few minutes. 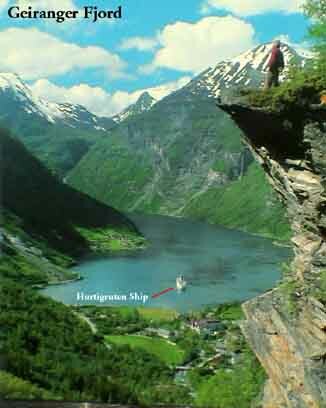 I didn’t realize we were going all the way up to Geiranger and back to Ålesund. 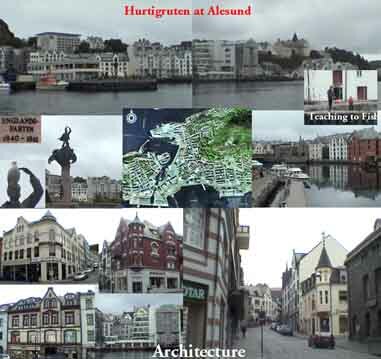 I hadn’t finished my run so I dashed off the boat and did it in Ålesund. We were only there for a half hour but we got to see a lot of the little town. The center of the town had a catastrophic fire in 1904 and fellow Europeans made donations to rebuild the town in Art Nouveau style making it a pretty place to visit. The architecture is quite nice. 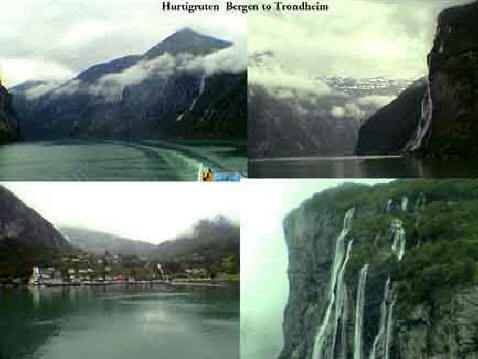 The town spans several islands connected by bridges. We departed on time at 6:45 and I worked on photos for a while. 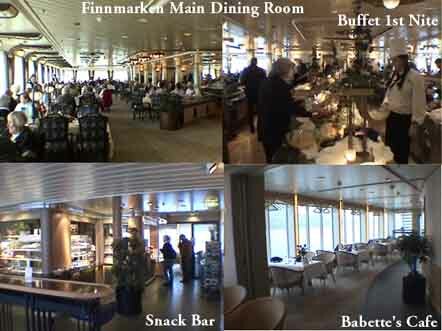 At 8:30 we had reservations for dinner in the main dining room. It was very nice that they had an excellent bottle of Navarra rioja on the wine list for only 270 Kr ($37,) the rest were all over $70. 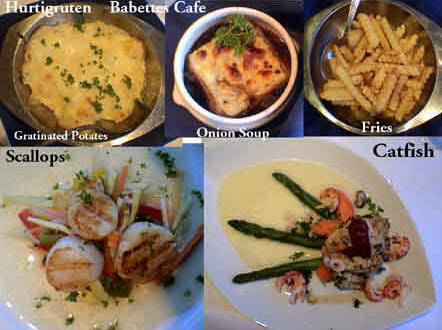 It was a set menu and we had shrimp on toast with orange caviar as an appetizer which was excellent. 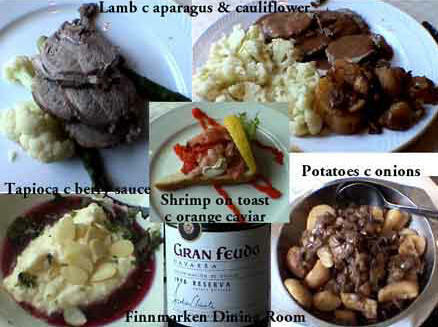 For entrée they served sliced lamb with asparagus and cauliflower along with potatoes with onions. I ate both our cauliflower and Marcia ate both our asparagus. It was great. My lamb was superb but Marcia’s was very tough and she barely ate it. I complained and they took it off the bill. For dessert they served an interesting Tapioca-like mixture covered in some berry sauce. I liked it; Marcia didn’t. 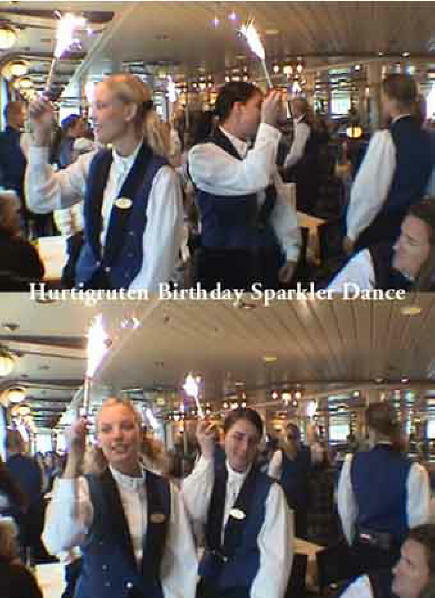 While we were sitting there the wait staff came out with large sparklers and surrounded a table and sang a Swedish rendition of Happy Birthday. They danced in circles and it was quite a spectacle. We saw this happen twice. 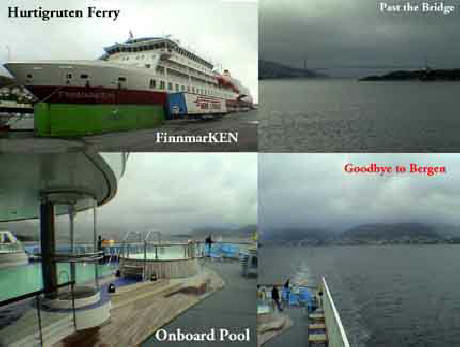 At 9:30 the ship stopped at Molde and we got off. 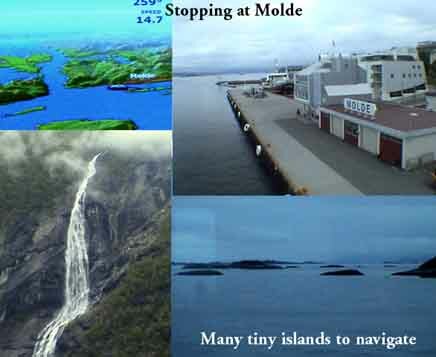 Molde is known as the town of roses because of all the gardens. 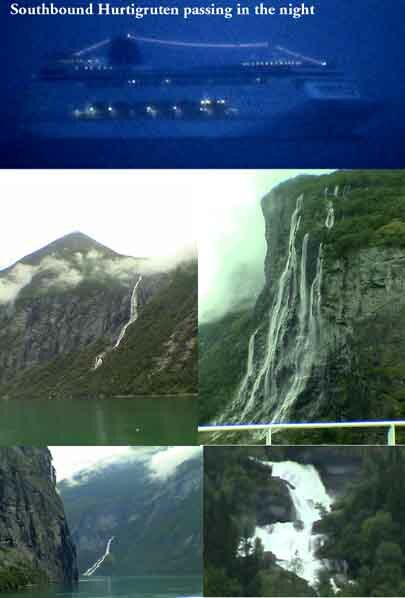 Near here is the Mardalsfossen, the highest unbroken vertical drop waterfall in Northern Europe, but we didn’t see it. The ship took off at 9:30 and I almost missed it. Won’t do that again. 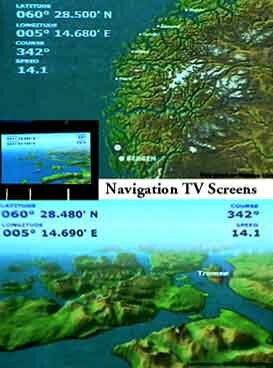 All throughout the ship are these flat screen TVs which show graphically where the ship is located just like on airplanes. It’s interesting to watch. At 10:30 we had wine together in the piano bar (no one playing) and I worked on photos and Diario #9. I went to bed at 3:30 AM.